Since Facebook is now allowing anyone to make chatbots, even the smallest businesses can build them to power growth. 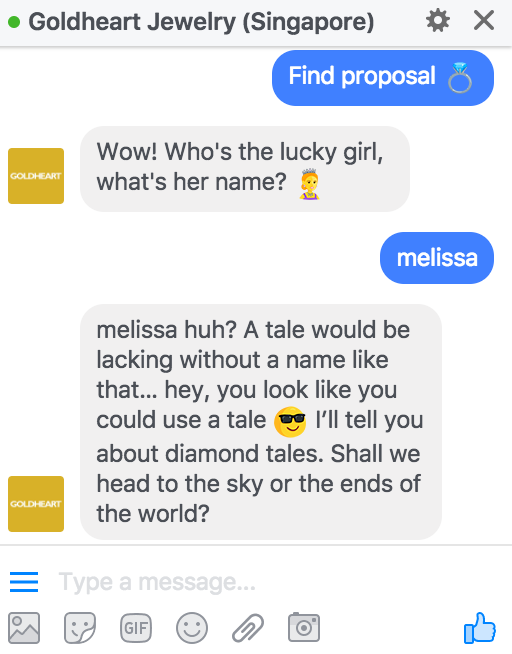 Recently, homegrown jewellery brand, Goldheart Jewelry, has jumped on the chatbot bandwagon and launched a chatbot on their Facebook page. 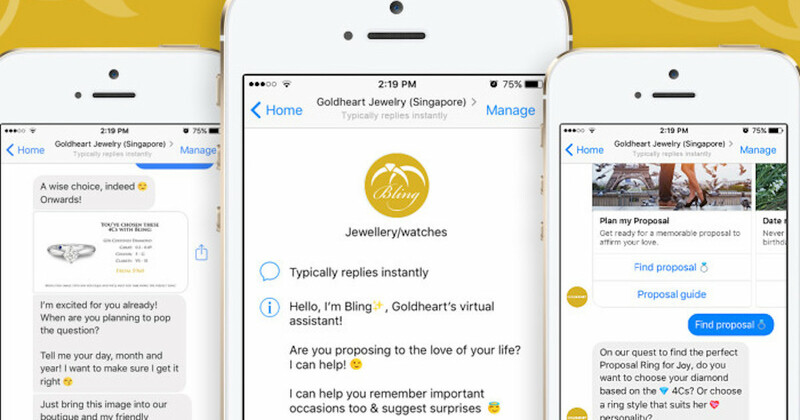 Called Bling, the chatbot is designed to provide consumers with on-demand product information so as to make jewellery shopping a more enjoyable and personalised experience. According to the brand, although the chatbot is targeted at both genders, the chatbot is especially designed for male customers to offer them advice and tips in various stages of the relationships – courtship, proposal, marriage and anniversaries. I am particularly impressed by this feature because well, guys can be pretty clueless when it comes to jewelry shopping. And I can vouch that all girls love and appreciate a box of bling on special occasions. Topics the chatbot covers include determining the gold carat and details about diamonds, reminders of important dates such as birthdays and proposals and recommendations for a suitable diamond ring. More features will be added to enhance user interaction and experience after assessing feedback from Bling’s launch. For the fun of it, I gave the chatbot a shot to see what responses it would generate when I input that I needed help finding a proposal ring. They asked the name of the “lucky girl” – fair enough. But I felt the follow-up response should ask me what type of girl this Melissa is. One’s personality is a strong telling of what kind of rings you would like. “Digitisation is the new frontier for retail businesses today. 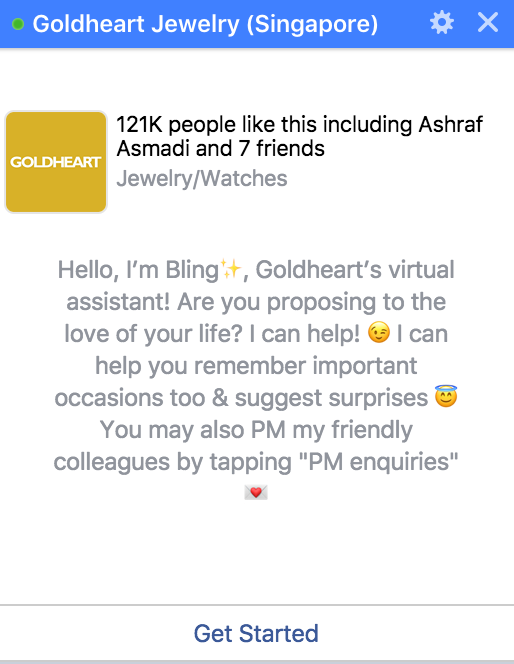 We are truly excited to be using social technology to engage the modern generation of time-strapped, fast paced consumers at an even more personal level than ever,” said Iris Tan, brand manager of Goldheart Jewelry. Interest in chatbots has skyrocketed because, for the first time, people are using messenger apps more than social networks – which have long dominated marketing. On top of that, they seem perfectly suited to today’s customers who demand greater convenience. OneReach found that 64 percent would rather text than call a business. Customers also appreciate the simplicity of chatbots, which don’t require installing a native app. For those willing to experiment, chatbots are potentially a massive opportunity. Now that the chatbot economy has ignited, we can expect to see bots proliferating as companies compete to enhance services. The best part is, it’s a competition even the smallest businesses can join, as bots are relatively cheap to build. Mark my words, Artificial Intelligence (AI) bots will soon displace receptionists, telemarketers, customer service agents, social media marketers, content producers, consultants and perhaps even sales personnel – to name a few – just as physical robots have replaced assembly workers, warehouse workers, and labourers. AI is not another platform like social media: it’s the tip of a violent shift in the way your customers will get information and interact with companies, products and services. Right now, AI and bots are still somewhat a leading edge, but by the end of 2017, interaction with AI devices and bots and the potential smarter and more personalised experiences they promise will become an expectation.